When we serve the Lord with all our heart and soul, we can be assured those who try their best to lay snares for our soul will be taken by their own devices. “Plead my cause, O Lord, with them that strive with me: fight against them that fight against me. For without cause have they hid for me their net in a pit, with without cause they have digged for my soul. Let destruction come upon him at unawares; and let his net he hath hid catch himself: into that very destruction let him fall. And my soul shall be joyful in the Lord: it shall rejoice in his salvation”. (Psalm 135:1,7-9). Have you ever looked up and saw a very large bird being chased relentlessly by a much smaller bird? Whenever I see this it comes to mind how the larger than life and those puffed up think they can overshadow the lesser and win in any situation. 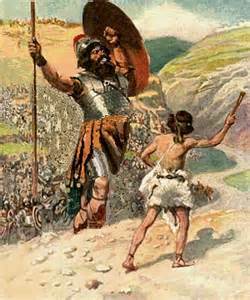 Goliath was a giant among men and never though the young David could take him with just a sling and stone. He didn’t know the young lad had already killed a bear and lion and that he was next. David knew that God was with him and the sword, spear, and shield of Goliath was no match for the mightier works of God! “Thy servant slew both the lion and the bear: and this uncircumcised Philistine shall be as one of them, seeing he hath defied the armies of the living God. David said moreover, The Lord that delivered me out of the aw of the lion, and out f the paw of the bear, he will deliver me out of the hand of this Philistine. And Saul said unto David, Go, and the Lord be with thee. Then said David to the Philistine, Thou comest to me with a sword, and with a spear, and with a shield: but I come to thee in the name of the Lord of hosts, the God of the armies of Israel, whom thou hast defied”. (1 Samuel 17:36,37,45). No matter what giant of a situation we go through in this life, remember we serve a almighty God who is above all Gods, and he does protect his people by the faith they have placed in him! The more we rely on him then the more he removes any enemy we encounter. (2 Thessalonians 1:4-6). For all who truly love the Lord Psalm 37 tells that we have the victory in this life when we are committed to God!…………………………….